Alpine ski resorts are making a special effort to attract tourists this summer, amid fears about climate change and the impact of warmer temperatures on winter snow. It is feared that without a growth in summer tourism some resorts could go out of business. Last winter was one of the poorest in recent years across much of the Alps, with some resorts having to shut at the height of the season as they had no snow. One resort in France, Abondance, has since announced it is to close. One of the major factors was a lack of snow in recent years and worries about future snow levels. A recent report by the Organisation for Economic Co-operation and Development (OECD) warned that rising temperatures could make some ski resorts unviable. "Skiing may just become a side attraction," said Hansruedi Mueller, Professor of Leisure and Tourism at the University of Berne in Switzerland. "However, it could be an opportunity for the Alps in the summer as people may want to escape hot, humid cities for cool mountain air." Most Europeans like to go to a beach in the summer, so the French resort of Tignes has rather bizarrely brought a beach to the mountain this year. It shipped in lorry-loads of sand and put it down by the lake and then proudly boasted of having the highest beach in Europe. 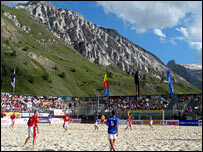 The sand was also used for a round of the European Beach Soccer League run by the former Manchester United icon, Eric Cantona. He now coaches the French beach soccer team. Tignes is perched at 2,100m (6,930ft) and is one of the highest resorts in the Alps - yet it recognises the need to attract summer business. It also hosted a stage of the Tour de France cycling race. "It is vital that we attract more people in the summer months," said Stephanie Aillet from the resort's tourist office. "There are so many things to do in the summer as we have mountain biking, golf, horse riding and great walking". 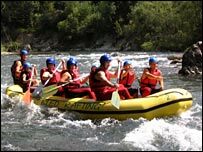 The more adventurous can go climbing, paragliding and even whitewater rafting. Tourism in the Alps is a multi-million pound industry that is severely threatened by climate change. About 80 million people head to the Alps, with the majority coming in the winter. Most resorts rely on skiing for 75% of their income. It is estimated that hotels will lose a quarter of their business if the temperature rises as predicted. Lift companies could loose 35%. The company Transmontagne, which operates mid-altitude resorts in France, Switzerland, Italy and Slovenia, is currently under a court bankruptcy protection order for six months. Warming weather is seen as a key reason for its financial woes. But the efforts of the resorts this summer are beginning to pay off. I saw hundreds of visitors in Tignes recently, while the Swiss resort of Verbier was hosting a classical music festival in an attempt to draw in more people. Again, the resort was busy. "We are seeing an increasing demand for people to work in ski resorts in the summer," maintained Iain Martin, from the specialist mountain recruitment company Natives.co.uk. "That is a sure sign more people are going to the mountains in the summer now." Some resorts though have always had a healthy tourist trade in the summer months. Chamonix in France has more visitors in summer than winter as people go for the climbing and walking. Zermatt in Switzerland has also had a busy summer trade. These resorts are the exceptions - yet rising temperatures might still benefit ski resorts generally. 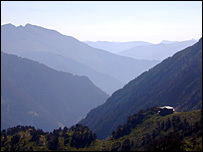 In the summer of 2003 during the heatwave across many parts of Europe, resorts saw an increase in tourism as people came to the cooler mountains to escape the heat. This summer, with a heatwave across much of central and southern Europe, the Alps have seen an increase in visitors. The Swiss city of Basel, down in the valley, has experienced some record-breaking temperatures this summer. "It's been so hot at times that the mountains have provided a welcome relief to the heat," said local resident Timothy Whiteman. The holiday company Crystal recently expanded its summer programme in the Alps and three years ago launched Crystal Active, a programme of holidays in the mountains during the summer. "It's been hugely successful and now many thousands of people are going to our 15 destinations," said Marion Telsnig, a spokeswoman for the company. "These types of holiday are set to grow and grow." The speed of climate change and its ultimate effect on the snow levels in the Alps remains unknown, but many ski resorts are waking up to the fact that they must bring in more visitors in the summer if they are to survive.